They’ve got the ability to create personality, elegance and they have a magical way of making rooms appear more spacious. It’s the latest trend in home décor that every designer seems to be jumping for: chic stripes. What’s the draw? Stripes can awaken rooms and provide a feel of sophistication. They can be simple and clean. As we’ve found, the options for stripes are endless! Yellow shades are welcoming colours that work well in the front entrance way of the home. Teal coloured stripes with room accents such as pink pillows and patterned fabrics can add excitement to a little girl’s room. Shades of cream can work well in the master suite or guest room where they’ll provide a calming effect. Lately, more clients have been asking us about striped walls, while they think about ways they’ll prepare their homes for sale or when they are planning to renovate or decorate rooms in their new homes. We tell them painting their own room stripes is easier than it looks! 1. Apply your base coat. The base coat will work as one of your stripes. Make sure to let the base dry at least 48 hours before you start painting your stripes. 2. Mark walls to determine how wide you want the stripes to be. You can use a level to ensure your marks are straight. 3. Apply tape from the ceiling to the baseboards around the room. 4. Apply the paint making sure to cover the entire area of the stripes. For more home decor tips and information on real estate trends be sure to follow us on Facebook at http://www.facebook.com/RoccaSisters. Let our highly responsive, executive team of professionals cater to all of your real estate needs. Call us today at 905-335-4102 or email us at info@roccasisters.ca to learn more about home staging and request a free evaluation. The Rocca Sisters & Associates’ personal approach and proven results will surpass your expectations! 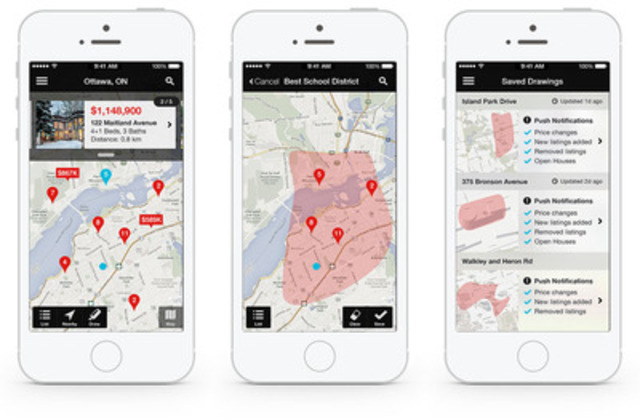 TORONTO, Feb. 27, 2014 /CNW/ – Royal LePage, in partnership with award-winning mobile agency Plastic Mobile, today announced the launch of the Royal LePage mobile app for Canadian house hunters. Available for iPhone, the new app is simplifying the property search process down to the swipe of a finger. Please visit http://www.royallepage.ca/promotional_en.html for more information, and/or to download the app which can be used on iPhone, iPad, iPad mini and iPod Touch. Serving Canadians since 1913, Royal LePage is the country’s leading provider of services to real estate brokerages, with a network of over 15,000 real estate professionals in more than 600 locations nationwide. Royal LePage is the only national real estate company to have its own branded charitable foundation, the Royal LePage Shelter Foundation, which is dedicated to supporting women’s and children’s shelters and educational programs aimed at ending domestic violence. Royal LePage is a Brookfield Real Estate Services Inc. company, a TSX-listed Corporation trading under the symbol TSX: BRE. Plastic Mobile is an award-winning mobile marketing agency building strategic solutions in m-commerce – encompassing payments, wallets, transactions and coupons – as well as mobile loyalty, location-based marketing, mobile gaming, and in-store initiatives. Based out of Toronto and New York the range of services include mobile strategy, design, development and marketing – all inspired by user-centric experiences to push forward a world in motion. Plastic Mobile facilitates top-tier brands such as AIR MILES, ING Direct, Beyond the Rack, Brookfield, Rogers and Pizza Pizza, into the fast-paced mobile evolution. Many home buyers have the itch to find their perfect home. Buying a house is very exciting, especially if you are a first time home buyer. However, it can also be overwhelming if you are not aware of what to expect and find yourself unprepared. There are a few things that all buyers should be well aware of before starting the hunt for their dream home. A big mistake that a home buyer can make is not getting a mortgage pre-approval before starting their search. This approval will let you know exactly what you can afford. It can be heartbreaking to fall in love with a home that ends up out of your reach. If you are just starting to think about home buying and want a rough estimate of what you can afford, the Canada Housing and Mortgage Corporation has a great tool to help you figure out the maximum home price you should consider, http://www.cmhc.gc.ca . Buying a home is a big decision. Determine what are “must have” factors for you. Is there a specific neighbourhood you need to be in? Do you want to be within a certain school boundary? Do you want to buy something new or are you willing to do some updating? It is important to distinguish between your “wants” and your “needs”. To learn all about the various Burlington communities & find which is the best fit for you, watch our detailed videos in the “Our Community” section of our website, http://www.RoccaSisters.ca . Cathy and Tanya’s proven hands-on buyer systems and strategies also include the collaboration of our Team. At The Rocca Sisters Team, we have enlisted some of the best and brightest Sales Representatives in the industry who work with buyers only – ensuring that you receive personalized and uncompromising service and that your best interests are served. They monitor the market minute by minute and will alert you to any new properties as they hit the market and more importantly, those that are from our own network and privileged to our clients before they even hit the market, which is the key to successfully finding and securing your home in this fast-paced market. Buyers that are relying solely on realtor.ca or mls.ca will be left behind! Our Buyer Representatives will alert you of listings at least 48 hours before they appear on realtor.ca. As the #1 Sales Team in Burlington and area for 4 consecutive years and the #3 Team in all of Canada for Royal LePage in 2013, you can look to our full service, highly responsive, executive team of professionals for all of your real estate needs. For more tips on buying a home or to be set up on a personalized home search that will serve your every need, please call us at our office directly at 905-335-4102, we’d love to share with you all the benefits to The Rocca Sisters Team advantage. Visit our website http://www.RoccaSisters.ca, or send us an email at info@roccasisters.ca . It would be our pleasure to assist you!